Jumper T8SG V2.0 Hall Gimbal transmitter plus size OLED 2.7 "OLED projector for multiple versions for Flysky Frsky. 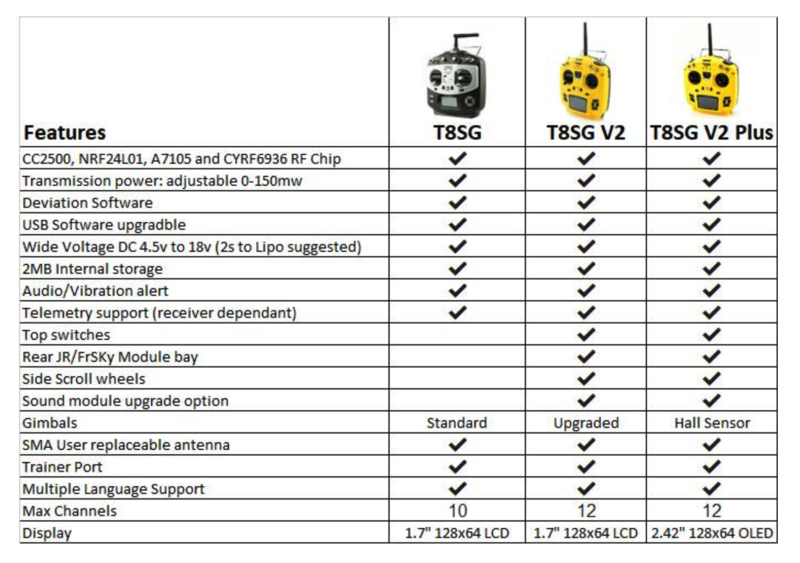 Jumper T8SG radio and T8SG + Multi-Protocol features a compact size and optional protocols, all combined in one product module is integrated with RF Chip four RF modules within the major. Various protocols can be quickly and easily selected from the menu format that allows you to tie a major radio protocols in the market today. The external module enables the use of proprietary protocols for more throwaway distance. Also T8SG + Version also has an OLED screen that lights the Hall sensor gimbals so smooth user experience even better. 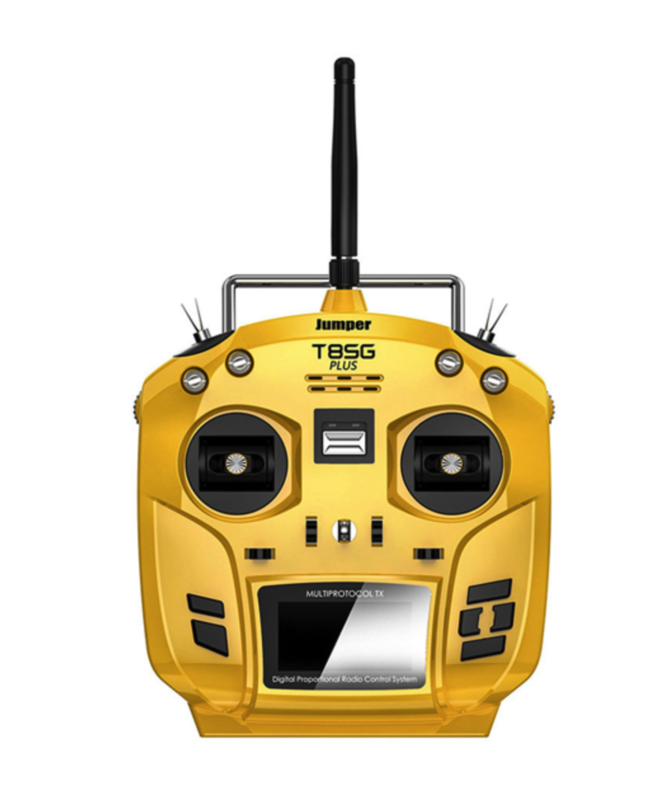 T8SG series solution is a hybrid portable truly for all of you, without compromising the feel and the ability to operate the radio, the real control of RC all your favorite broadcasts from the air and space. for more models! Dimensions: 158 x 150 x 58 mm. The frequency of delivery: 2.400GHZ-2.7GHZ. The transmitter modules: Module One in four high frequency (CC2500 CYRF6936 A7105 NRF2401). Sending: Max 22dbm (transmission speed). Antenna gain: 2db (antenna, removable, easily adjustable). Voltage active: DC4.5-DC18V (size AA battery factory with the 4 x 2 recommended charging lithium 2S, batteries not included). Remote control distance:> 2km @ 22dbm. Number of channels: Up to 12 channels (depending on the receiver). OLED display measures 2.42 inches with a resolution of 128 * 64. How Waggle: Vector 3D space without contacting Hall joystick. Socket module compatible JR / FrSKY back. How to upgrade: upgrade online via USB. * DSM2 / X full. 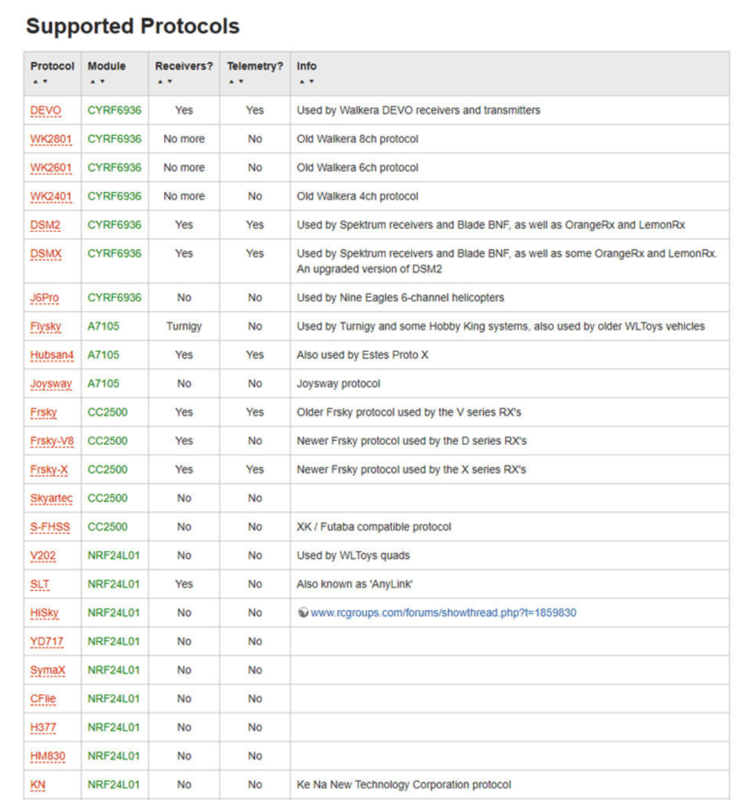 Toys WL, set Hubsan, set Esky and many more (there are currently over 40 supported protocols). Using open source software with the support and development by continuing to add new protocol on a regular basis. Mode Simulator: ppm output standard 3.5 mm. 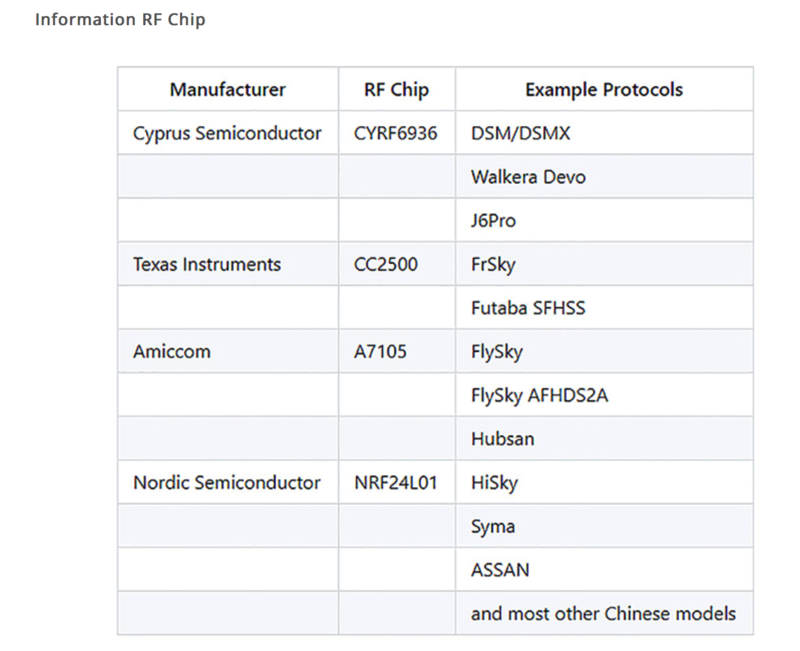 * Create RF module 4 in 1 (CC2500 CYRF6936 A7105 NRF2401). 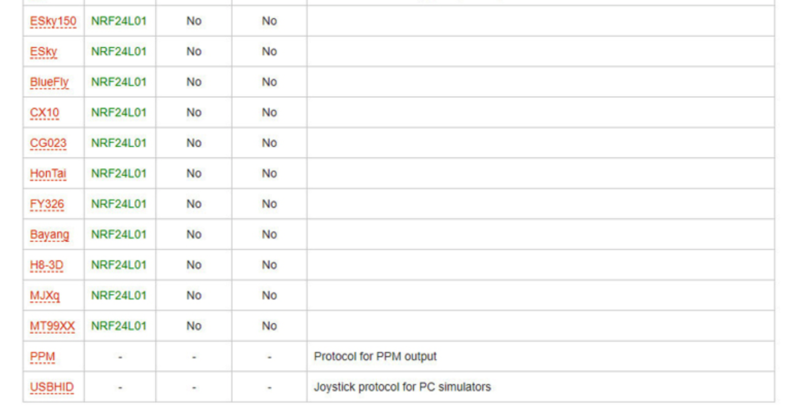 * Multi-protocol firmware is open source, compatible with the remote control key. * Do not touch vector space 3D Hall remote Gimbals (T8SG plus only). * T8SG positive OLED display measures 2.42 inch display is bright and works even in direct sunlight. * The input module compatible JR / FrSKY back. * USB online upgrade firmware. * You can adjust the transmission to adapt to the needs of different places. * The antenna can be removed and easily replaced. * Low power consumption and longer battery life. * Up to 12 output channels (Depending on the receiver), Open Source Firmware each channel can be programmed fully. * Wide input voltage (recommended Lipo 2s). 1.) design tools to a whole new look and feel unique, ergonomic. 2) an additional 2 switches on. 3.) Improve the quality switch on all switches to ensure the reliability and quality feel better. 4.) The new design Gimbal HALL SENSOR FOR accuracy and crisp response. 5.) The input module, RF module for JR third parties. 6) Change the dial to change a wheel on the side to use. 8.) 2.7 "OLED backlit OLED display. 8.) Add the AA batteries for easy battery installation (2s Lipo optional). 9.) Adjust switch off with dual LED status indicator. 10.) box shipments improved, high strength, and high-end look.